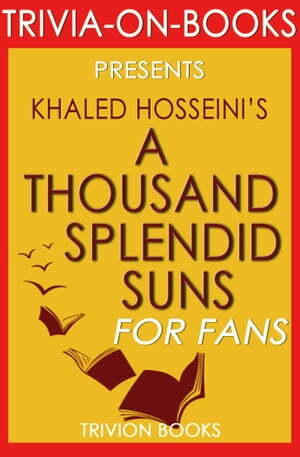 Collins Booksellers - A Thousand Splendid Suns: A Novel By Khaled Hosseini (Trivia-On-Books) by Trivion Books, 1230001208542. Buy this book online. Take the fan-challenge yourself and share it with family and friends! A Thousand Splendid Suns is a deeply moving story of friendship and love with a backdrop of Afghanistan’s history. Mariam and Laila are women from different generations and vastly different backgrounds. When Laila comes into the family as the second wife, Mariam initially has some trouble adjusting. Despite that, the women form a strong bond of friendship against their common enemy—their husband. Can they survive and thrive while war is erupting all around them and their husband becomes more and more difficult? A Thousand Splendid Suns by Khalid Hosseini was a number one New York Times bestseller for fifteen weeks after its release. This second novel from Hosseini received positive reviews from Kirkus, Publishers Weekly, and the Library Journal. Trivia-on-Books is an independently curated trivia quiz on the book for readers, students, and fans alike. Whether you're looking for new materials to the book or would like to take the challenge yourself and share it with your friends and family for a time of fun, Trivia-on-Books provides a unique approach to A Thousand Splendid Suns By Khaled Hosseini that is both insightful and educational!